Afghan villagers gather at a house which was destroyed during US air raids in the Tagab Valley village of Inzeri, in Kapisa province, Afghanistan. Rabble.ca -- August 19, 2010 marks 91 years since Afghanistan gained its freedom from the British empire, following three bloody wars of independence. US Secretary of State Hilary Clinton has issued a video statement to mark the occasion. It's worth watching or reading the text in full, if only to appreciate the new empire's irony-laden platitudes. This August 19th, on behalf of President Obama and the American people, I want to congratulate the people of Afghanistan on 91 years of independence. Thai police arrest a Thai Muslim. Below is an excerpt from Thai socialist Giles Ji Ungpakorn's latest book, Thailand’s Crisis and the Fight for Democracy. It provides an historical background to Thai politics from the pre-capitalist era, through the turmoil of the 1930s and 1970s, up to the present day. It has been posted at Links International Journal of Socialist Renewal with Giles Ji Ungpakorn's permission. Giles Ji Ungpakorn is a political commentator and dissident. In February 2009 he had to leave Thailand for exile in Britain because he was charged with lèse majesté for writing a book criticising the 2006 military coup. His latest book will be of interest to activists, academics and journalists who have an interest in Thai politics, democratisation and NGOs. December 15, 2009 -- The antipathy of mainstream Australian society toward Muslims is not a new development. As early as 1912, Australians were being cautioned about the danger of Australia falling under Islamic control. The adoption of camel transport had brought Muslim men from Afghanistan to Australia in increasing numbers from 1860 until they controlled the camel transport business. Despite their valuable contribution to the expeditions carried out by the European “explorers” and their vital role in establishing a transport system in the harsh outback conditions, the early Muslim immigrants were considered inferior to the dominant, white, Christian Europeans and marginalised in a similar way to the detribalised Aboriginal community. Paquistão: o que fazer em relação ao Fundamentalismo Religioso? Mais uma vez o Paquistão tornou-se foco de atenção mundial. Todos os dias há notícias sobre o último ataque suicida ou sobre operações militares, com mortos, feridos e comunidades desalojadas. Recentemente escolas foram ordenadas a fecharem suas portas por mais de uma semana. Até mesmo crianças falam sobre mortes e ataques suicidas. “Let’s deal with the ISI and the Pakistan military and let’s go recruit these mujahideen. Here is a very strong argument which is… it wasn’t a bad investment to end the Soviet Union but let’s be careful with what we sow… because we will harvest.” – US Secretary of State Hillary Clinton, April 23, 2009. October 28, 2009 -- Once again Pakistan has become the focus of world attention. Every day there is news of the latest suicide attack or military operation, with killings, injuries and the displacing of communities. Recently schools were ordered closed for more than a week. Even children talk about death and suicide attacks. With more than 125 police checkpoints in Islamabad, it has become a fortress city. Lahore and other large cities are suffering the same fate: there are police road blockades everywhere. After each terrorist attack authorities issue another security high alert and set up additional barriers. How ironic that, until recently, officials and the media described these “terrorists” as Mujahideen fighting for an Islamic world. Sydney protest against the Afghanistan war, October 8, 2009, organised by the Stop the War Coalition. See Malalai Joya's message to the protesters below the interview. October 9, 2009 -- Malalai Joya has been described as “the bravest woman in Afghanistan”. A long-term opponent of the North Atlantic Treaty Organization (NATO) presence in her country, Malalai Joya first rose to prominence through a heartfelt and controversial speech in 2003 that was an indictment of the powerful positions gifted to Afghan warlords by the US-led coalition. She was elected to the Afghan parliament in 2005 and continued her campaign against war criminals and fundamentalists there until being suspended in 2007 for criticising fellow MPs. Activists Noam Chomsky and Naomi Klein are amongst those who have called for her reinstatement. Steal This Radio -- Attorney Leonard Weinglass discusses the case of the Cuban Five with Mitchel Cohen. The show first aired on August 11, 2009. September 15, 2009 -- BBC -- The Iraqi man who threw his shoes at former US President George W Bush, has been released from jail in Baghdad, his brother has told the BBC. Muntadar al-Zaidi's act of protest made him a hero in large parts of the Arab world and beyond. September 13, 2009 -- Political prisoners and Cuba can be a confusing mix, in our times of mass propaganda. Three groups have attracted international attention, over the past decade. The first group, 70 or so (the ``dissidents''), were arrested in March 2003 by the Cuban government and charged with taking money from a US program which aims to overthrow the Cuban constitution. Amnesty International and many European states, along with the US government, immediately declared them ``prisoners of conscience''. A number have since been released. The second group of several hundred (``enemy combatants'') were collected by the US government in Afghanistan and Pakistan over 2001-2002 and held for many years in concentration camps at a US military base carved out of the island of Cuba. International protest built up more slowly, and eight years on many are still held without charge or trial. 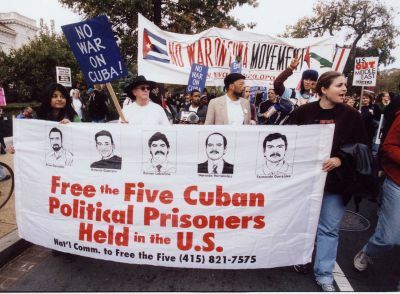 The third group of five men (``the Cuban Five'’) were arrested in the US in 1998 and accused of being spies, for passing on information about groups in south Florida that were preparing terrorist attacks on Cuba. The US courts have rubber-stamped their convictions. On September 12, 2009, they completed 11 years in US jails. In the week before the first anniversary of the devastating September 11, 2001, terrorist attacks in New York and Washington, TV networks aired a seemingly never-ending string of ``special events'' featuring ``exclusive'' or ``never before seen'' footage of the collapse of the twin towers of the World Trade Center (WTC) and its aftermath. People around the world again experienced the horror, anger and tragedy of that terrible day, when almost 3000 working people were murdered. May 21, 2009 -- This is a formal appeal by the Labor Relief Campaign to help in the fight against the Taliban and the Pakistan government's military operations. The purpose is to provide immediate help to some of the more than 1.5 million internally displaced people from the Malakand Division of the North West Frontier Province (NWFP) in Pakistan. This displacement has resulted from the fight between the Taliban and the Pakistani government. We also aim to publish Mazdoor Jeddojuhd in the Pushto language more frequently. At present it is published weekly in Urdu and monthly in Pushto. We want to counter the ideas both of religious fanatics and state repression. We aim to aid the labour and social movements in the province by publishing their activities and views, bringing them together to form new networks. The Taliban have taken over parts of Pakistan. They have threatened to occupy other parts as well. To pacify them, the government went into an accord with the Taliban this April 2009, imposing a so-called Nizam Adl (system of justice) in Malakanad. The Taliban then imposed medieval laws in the areas under their control, targeting women and minorities. This accord also provided the Taliban with the opportunity to move into other areas. Refugees flee the military operations in Swat Valley, Pakistan. 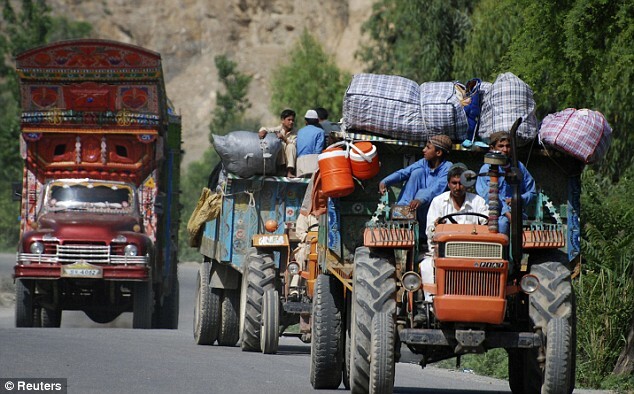 May 17, 2009 -- The mass exodus from Swat is making headlines globally. Over a million have been displaced. This is the worst humanitarian crisis since the Rwanda tragedy in 1990s. The explanation offered is that this is necessary to flush the Taliban out of Swat's lush, green valley in Pakistan's north. This military operation, launched in order to stabilise the US occupation of Afghanistan and its so-called "war on terror", is hardly mentioned in the corporate media. On the contrary, major US newspapers have been invoking the fear that Pakistan's nuclear weapons might fall into the hands of the Taliban. Is this a story planted by the CIA? This is the fourth time in less than three years that the Swat area has been subjected to a military operation. However the latest offensive is of a different character. Click HERE for an exclusive free excerpt from Kevin Funk and Steven Fake's latest book, Scramble for Africa. Major politicians routinely pay homage to suffering Darfurians in their speeches, well-heeled Darfur advocacy groups take out full-page ads in the New York Times, and commentators regularly fill op-ed ledgers around the country with righteous, indignant calls for the West to act to end the suffering. Yet for all the rhetorical attention and concern afforded to Darfur in the US, what is actually understood about the US role in addressing the conflict? Further, what do we know about the historical and current nature of Washington’s relations with Sudan, and how does this relate to our understanding of the Darfur crisis, and what we can do to address it? To mark the 20th anniversary of the Lockerbie air disaster, Links International Journal of Socialist Renewal is republishing these important articles. Since their first publication, important new evidence has cast even more doubt on the unjust conviction of Abdelbaset Ali Mohmed al Megrahi -- see comments section below. February 14, 2001 -- The eminent barrister Horace Rumpole has often noted that the “golden thread running through the history of British justice” is that a defendant is innocent until proven guilty by the prosecution “beyond a reasonable doubt”. Of course, Rumpole is a fictional character created by writer John Mortimer. As the verdict handed down in the Lockerbie bombing trial proves, the “golden thread” is just as fictional. On January 31, 2001, the three Scottish lords sitting in judgement on the charges against two Libyans accused of planting the bomb that felled Pan Am flight 103 over Scotland on December 21, 1988, found Abdelbaset Ali Mohmed al Megrahi guilty of the murders of the 270 people killed in the disaster. Al Amin Khalifa Fhimah was found not guilty. Click HERE for more on Muntadar al-Zaidi. By now, you've all seen the footage of the Iraqi journalist hurling his shoes at George W. Bush during a press conference in Baghdad on December 14, 2008. See below. What has not been so widely reported are the words Muntadar al-Zaidi, a correspondent for Cairo-based al-Baghdadiya TV, shouted. As the first shoe was thrown at Bush, he said: "This is a goodbye kiss from the Iraqi people, you dog." And with his second shoe, which the president also dodged, al-Zaidi said: "This is for the widows and orphans and all those killed in Iraq."